HUDSON - A long drought and several bouts of freezing weather killed Linda Carey's lawn, and her homeowners' association is none to happy about the large patch of dirt and weeds. It sent Carey a warning letter. "I have to put new sod down by March 15th or they'll take further legal action against me," she said. Carey is not alone: the Beacon Woods Civic Association sent warning letters to 168 homeowners warning them they are in violation of a deed restriction requiring a green lawn. "It's stressful, it's not good," she said. arrangements for purchase and or delivery of sod we encourage you to do so now." "With water restrictions being what they are, the weather, it's gotten awfully cold, it seems kind of foolish," homeowner David Epperson says of the warning letters. Beacon Woods says it may reconsider the green lawn deed restriction. 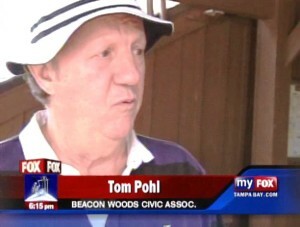 "We plan on taking up this issue of landscaping in terms of the drought," HOA president Tom Pohl said. "We plan on taking a close look at this issue." But Beacon Woods has a history of taking brown lawns very seriously. Joe Purdente spent a weekend in jail after he defied a court order that he plant new sod to replace his brown grass. "I don't know what they're making everybody resod?" Purdente said. 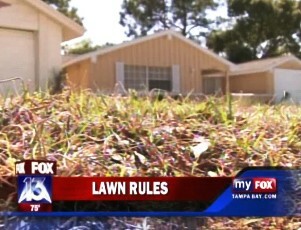 For now, his donated lawn is brown, but he hasn't been served with a warning letter. "I water when I'm allowed," Purdente said. Because of the long drought, the Southwest Florida Water Management District may help home owners being challenged by their associations over brown lawns. "If they send us their violation notices, we'll contact the association," said the district's Robyn Felix. For now, Linda Carey says she can't afford a long legal fight with the Beacon Woods Civic Association, or a new lawn.